Move wholesale inventory in the easiest, fastest and most efficient way, through AuctionMax from AutoUpLinkUSA. Never has it been so easy and profitable for dealers to upload their online vehicle listings right from AutoUpLinkUSA Inventory Management into various online auction services. Quick, fast and as easy as pushing a button. 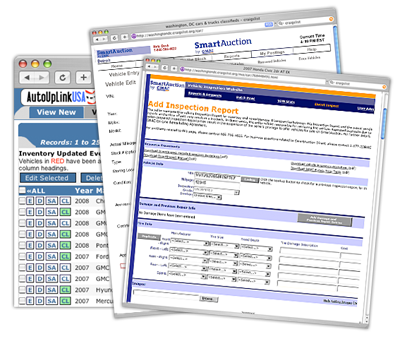 With AuctionMax integrated into your AutoUpLinkUSA tools, move as many vehicles as you want from your online listings through AutoUpLinkUSA to SmartAuction, OPENLANE and Manheim OVE. AutoUpLinkUSA can also assist in photographing and publishing equipment and options on your wholesale inventory to increase the opportunity for positive wholesale results. Simplify your total online auction processes and contact AutoUpLinkUSA Mid-Atlantic (AULMA) today.